Liberal’s defense struggled in a lopsided 73-60 loss at Scott City Friday night. The class 3A Beavers (8-0) shot mainly layups in beating 5-4 Liberal. This was a much anticipated matchup Liberal’s Jade Cathey and Scott City’s Ron Baker who are considered to be the best in Western Kansas. The verdict is still out regarding who is better after an ugly foul filled game which saw Cathey whistled for his third foul in the first quarter. Tyson Deaton and DeVondre Livingston both picked up their third foul in the second quarter as Liberal head coach Drew Gruver had to go to a small lineup late in the first half. The Redskins trailed 27-16 at halftime and were in an 18 point hole at one time (38-20). 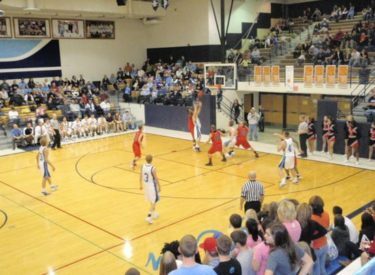 Liberal was never really in striking distance because Scott City made too many layups. Who is better between Scott City’s Ron Baker and Liberal’s Jade Cathey, that probably wasn’t determined last night. Baker scored 20 and Cathey scored 21 including 19 in the second half. Tyson Deaton added 13. Liberal faces Palmer Ridge, Colorado Thursday night at 8:15 in Colby on Talkradio 1270 and kscbnews.net.